This page contains Shiloh lesson plans, teaching resources, and student activities. 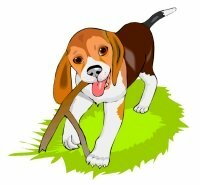 This page contains Shiloh lesson plans and a fun project for your students to complete. 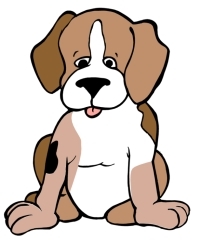 On this page, you will find a set of teaching resources for a fun individual or group project to use with Phyllis Reynolds Naylor's touching story about a boy and a dog that he rescues from an abusive situation. This extra large and unique project is shaped like a dog and the finished projects measures 11 x 20 inches. Shiloh, written by Phyllis Reynolds Naylor, is one of my students' favorite books that we read together as a class. My students love discussing the themes in this book and they identify with Marty Preston and how he wants to help an abused animal. If you are doing a Newbery Medal study in your classroom, this is a great book choice to use as a whole class novel. 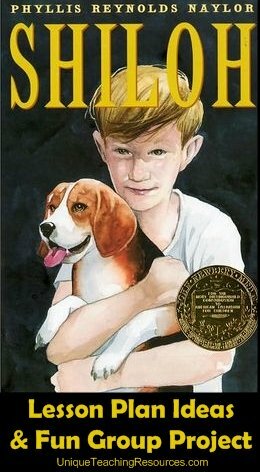 Shiloh won the Newbery Medal in 1992. Watch the short video slide show below to see examples of my students' finished group projects and bulletin board displays of their Shiloh projects. Phyllis Reynolds Naylor has written two other books in this series called Shiloh Season and Saving Shiloh. I have a few copies of each of these two books in my classroom library so that after we have read Shiloh together as a class, my students can read these two other books for their independent reading program. Shiloh has also been adapted into a movie and my students have always enjoyed watching the movie after they have read the book and completed their Shiloh projects together. Below you will find some of the Shiloh Lesson Plans that I have developed over the years as I have used this novel with my students during our Newbery Medal book study. All of the resources on this page include a second version of each resource that contains UK spelling and punctuation rules. This five page banner is included for free in this set of Shiloh teaching resources. You will be emailed a download link for this Shiloh project so you can download and use it today! Classroom bulletin board display of completed Shiloh group book report projects. 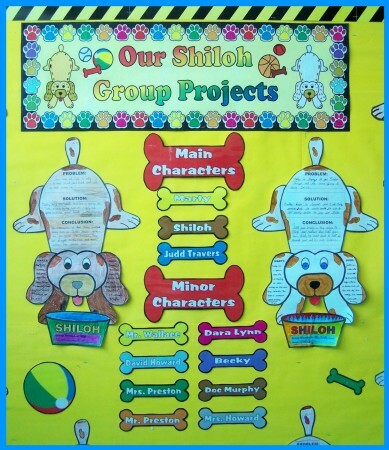 One of my students' favorite projects during the entire school year is this group project for Shiloh written by Phyllis Reynolds Naylor. 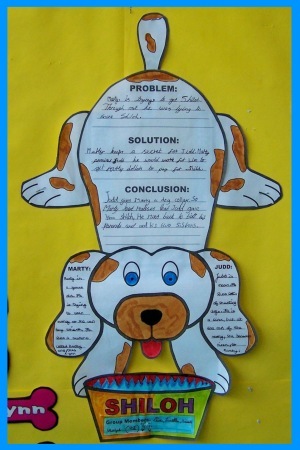 For this project, students work together to write about the story in unique dog shaped templates. My students love completing this project with the members from their group! For the writing sections, the group members describe Marty Preston, Judd Travers, the main problem that Marty is trying to solve, how Marty solves his problem, and the conclusion of the book. You can see these writing sections in the photograph below. This set includes step by step directions on how to assemble the 4 pages of templates into a large dog. 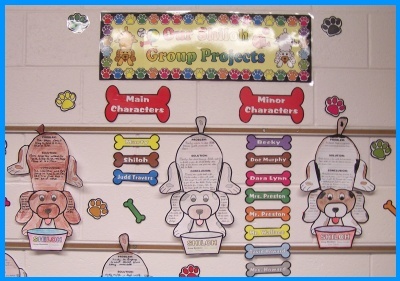 Depending on the age of your students, you could assemble these dog projects ahead of time for your students. Each dog takes me around 5 minutes to assemble myself. I have given my fifth grade students the direction sheets, and they were able to assemble their projects themselves. There is one page of assembling directions, and then there are specific directions provided on the actual dog templates that show students where to cut and glue. Below you will see an example of the assembling directions page. This is a cooperative group project and students begin their Shiloh projects by completing their first drafts together. There are two pages of first draft worksheets. For this group project, students describe Marty and Judd and write about the main problem, solution, and conclusion. Below you will see an example of the first draft writing worksheets. Students should proofread and edit their first drafts together before they begin their final drafts. 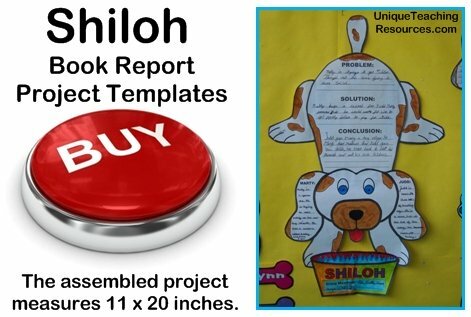 This unique and fun group project for Shiloh includes 4 worksheets with templates that assemble into a large dog. The finished project measures 11 inches in width and 20 inches in height. 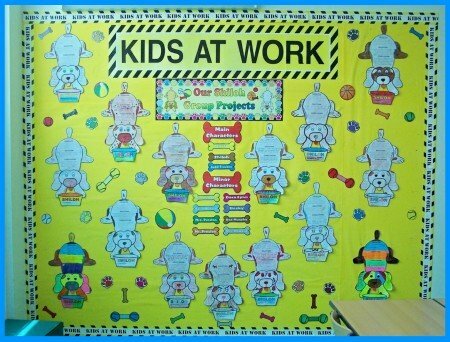 Your students will love working on this large group project together and the finished projects make a dynamic classroom or hallway display. Below are examples of the 4 worksheet templates. 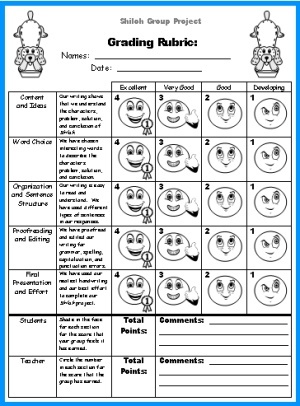 After each group has completed their Shiloh projects, they can evaluate their project using the group project grading rubric that is provided in this set. After the group has graded their project, there is also an area on this rubric for the teacher to evaluate the project. 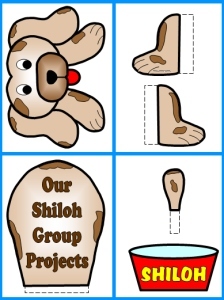 When I am introducing this Shiloh project to my students, I like to provide a visual example of a completed dog project for them to see at the front of the classroom. 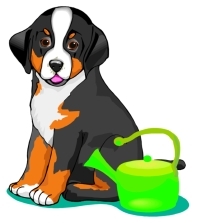 I have included color dog templates for you to use in order to save you time in having to color these templates yourself. Creating bulletin board displays is a time consuming task for teachers. 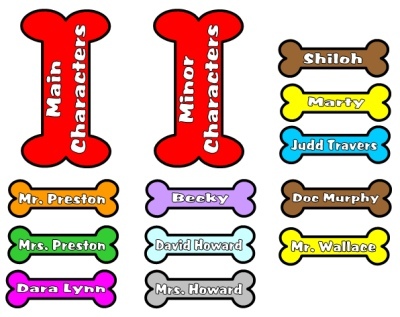 To save you time in preparing your Shiloh bulletin board display, I have provided a 5 page color banner for you to use for your classroom display. 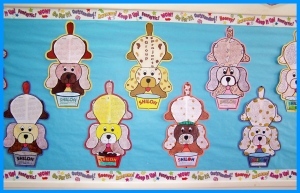 To add some color and dog themed graphics to your bulletin board, I have included Shiloh bulletin board accent pieces in this set of Shiloh teaching resources. Below is a photograph that shows an example of a bulletin board display using some of these accent pieces. 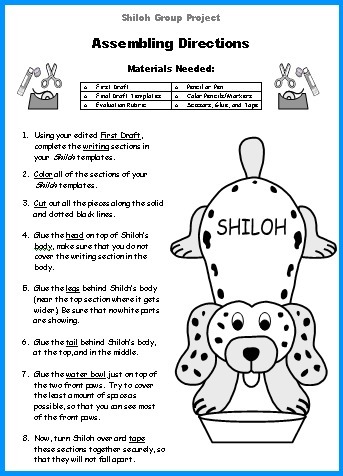 I have included 22 pages of Shiloh bulletin board accent pieces in this Shiloh lesson plans set. Below you will find examples of what these accent pieces look like. completing this dog shaped group project together! an engaging and fun book report project activity for your students. 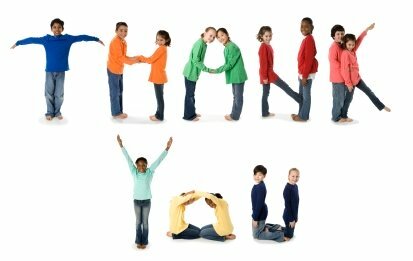 Thank you for visiting my Shiloh lesson plans page.